Why do people think thorns are ugly? Is it because they cause you pain? They are there to warn people like me. The love that you had for the rose will die when the rose withers away. Nothing can stay as beautiful as the rose, but sooner or later the beauty is beaten out by the ugly. No matter how many times I told myself that...it never stuck. I fell in love with the rose even if the thorns were there. 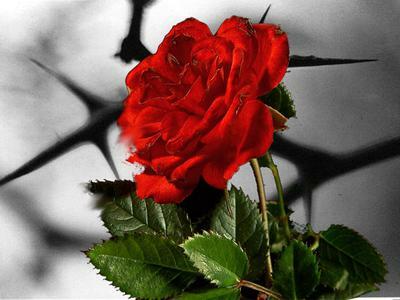 No...I didn't fall in love just with the rose, but with the thorns too. I really liked the poem. For each person, it conveys a different meaning and for that reason, you are able to make it connect with you. I've never heard of this poet, but her works seem like something I'd continue to enjoy!